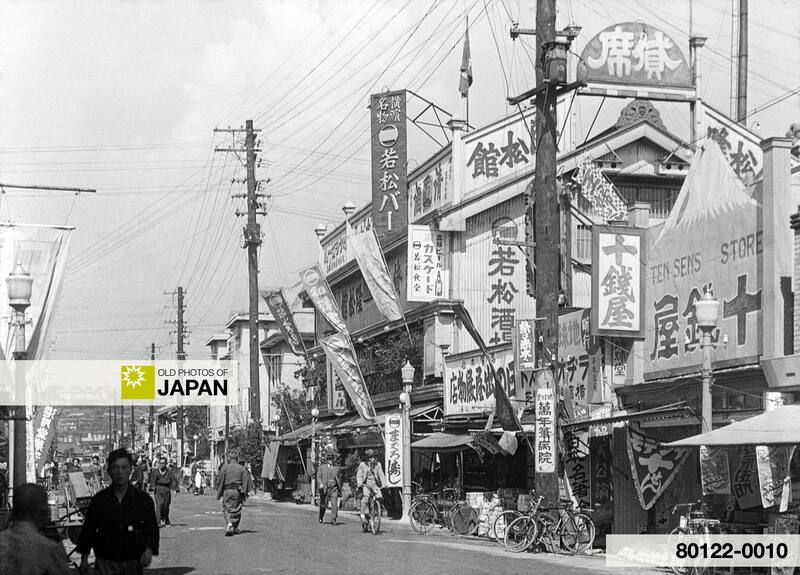 Yokohama’s Bentendori was a popular shopping street that lost most of its charm when it was destroyed during the Great Kanto Earthquake of 1923. This photo shows the rebuilt Bentendori. Interesting is the Ten Sens Store (1 sen was one hundredth of a yen so this was basically a Ten Cents Store) on the right. These days, 100 yen stores are very popular in Japan. Except for the price itself, not much seems to have changed. For a photo of the original Bentendori, see Yokohama 1890s • Bentendori. You can also licence this image online: 80122-0010 @ MeijiShowa.com.